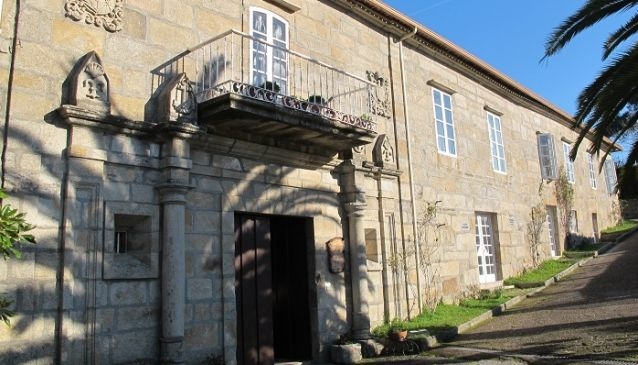 Pazo de Pías is located in the ward of Ramallosa, close to the shopping centre at Nigrán and has been converted into an albergue and spiritual house for pilgrims on the Portuguese Way. It is set in large, landscaped grounds, in an elevated position with mountain views. There is a large grain-store which is very unusual in Galicia as it has two floors. In terms of its rich history originally a private mansion house dating back to the 17th century it was donated to Apostolic Ladies of the Sacred Heart in the 1950s. The Pazo is stone-built and its main two-storey elevation is south facing while the interior is L-shaped. The entrance is rich in architectural detail including two pairs of Doric columns, two pilasters and two splayed,small windows. Above is a small balcony and either side are a decorative shield and the coat of arms. In its interior the stone balustrade/stairway is interesting.